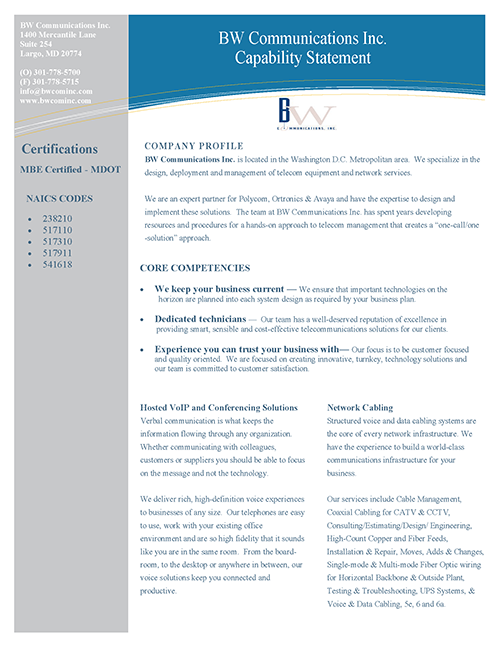 BW Communications Inc. is located in the Washington D.C. Metropolitan area. We specialize in the design, deployment and management of telecom equipment and network services. We are an expert partner for Polycom, Ortronics & Avaya and have the expertise to design and implement these solutions. The team at BW Communications Inc. has spent years developing resources and procedures for a hands-on approach to telecom management that creates a “one-call/one-solution” approach. We ensure that important technologies on the horizon are planned into each system design as required by your business plan. Our team has a well-deserved reputation of excellence in providing smart, sensible, and cost-effective telecommunications solutions for our clients. Our focus is to be customer focused and quality oriented. We are focused on creating innovative, turnkey, technology solutions and our team is committed to customer satisfaction. Verbal communication is what keeps the information flowing through any organization. Whether communicating with colleagues, customers or suppliers you should be able to focus on the message and not the technology. We deliver rich, high-definition voice experiences to businesses of any size. Our telephones are easy to use, work with your existing office environment and are so high fidelity that it sounds like you are in the same room. From the board-room, to the desktop or anywhere in between, our voice solutions keep you connected and productive. Structured voice and data cabling systems are the core of every network infrastructure. We have the experience to build a world-class communications infrastructure for your business. Our services include Cable Management, Coaxial Cabling for CATV & CCTV, Consulting/Estimating/Design/ Engineering, High-Count Copper and Fiber Feeds, Installation & Repair, Moves, Adds & Changes, Single-mode & Multi-mode Fiber Optic wiring for Horizontal Backbone & Outside Plant, Testing & Troubleshooting, UPS Systems, & Voice & Data Cabling, 5e, 6 and 6a.